My son has special needs and I bought it to see if he could use it . It was the best thing I could have gotten. He's so happy he can now get his ice on his own. 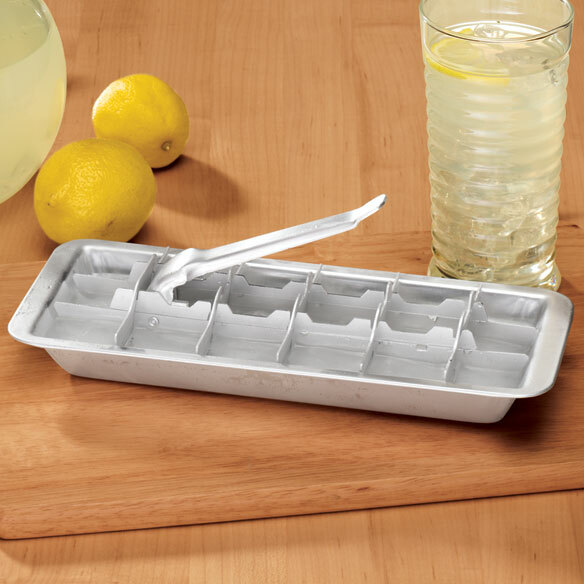 I have used an aluminum ice cube tray like this is years gone by.I have arthritis and cannot twist ice cubes out of a plastic ice cube tray. This tray allows me to manage ice cube trays again. They are a piece of junk! I should have read the reviews before I purchased this product. loved having stainless ice cube trays, however before even attempting to pull the handle I had to defrost the ice some. Even using these preventative measures all three tray's handles broke off (one side on 2 of them and entirely on the third). Made great ice cubes ate first, but ultimately, a total waste of money, can't use a single one of them! The "easy release" handle snapped off the first time used. I bought the ice tray to get away from plastic chemicals that leach into the water while it freezes. I am disappointed in the quality for the price I paid for the tray. Definitely NOT a quick-release handle!! I had to run the whole thing under water to get the handle to move at all. First time I removed ice cubes the tray developed dents on the bottom. Second time, the tray actually bent! Made-in-[@]doesn't mean "cheap" any more, it means "cheaply made". Poor decision on the part of Easy Comforts! Easier to remove cubes than the plastic twist type trays. I have been looking for these trays .thanks for the great price. They are the best trays in the world ! I once had an ice cube tray like this one. This is the first one I have noticed in several years. I am tired of the plastic trays that always breaks when frozen and it's hard to get ice out of them. We have known this product to work well for years!! Been looking for some of these for a long time. Tired of twisting; back to the good old ways. I chose these because I'm tired of replacing the plastic and silicon ones. These last for years! I have medical issues with my hands that make using regular ice tray very painful to use and in some cases I could not break loose all cubes. But with this style ice tray it requires very little effort with your hands to use these trays. Because we don't have any ice tray in stock. I just love the simplicity of the product. Modern ice trays just frustrate me. I chose this item because this was the best price I could find anywhere. My elder mother wanted it. Classic and functional. I'm just not a fan of plastic trays. For a person who does not have an ice maker and plastic ones eventually give. Easier for grip too. I chose this as I want to make special ice cubes for ice tea and use spring water. I've had these before and like them better than plastic.